Stourbridge Decorative and Fine Art Society (NADFAS) are sponsoring a striking piece of stained glass to commemorate the London 2012 Olympic Games. The stained glass project has been led by Paul Floyd of Transparent Glass Studio and has been designed and made by students from the Glasshouse College in Stourbridge. Both students have been helped and guided by Glass Artist & Designer Paul Floyd, whose studio is based at the Ruskin Glass Centre in Stourbridge. The finished stained glass art work will be displayed in the new Glasshouse Arts Centre which is due to open in August 2012. 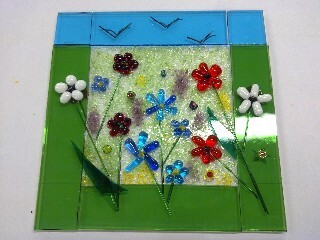 All tools are provided and the course includes materials for a stained glass panel up to 35cm x 35cm. Only 3 people per workshop for maximum individual attention. Glass designer & maker Paul Floyd will lead afternoon sessions on glass fusing. The advanced workshop will allow you to explore the techniques of fused glass as a creative medium. Within the workshop you will build on your skills with cutting glass to a pattern and working with coloured sheet glass, frits and powders. You will create an original piece of glasswork and can make either a panel or a medium sized round/square bowl 20cm diameter. Only 4 people per workshop for maximum individual attention. For Booking Contact: Paul Floyd or subscribe to mailing list for future events, by entering your email address and by pressing the follow button on the right.